I saw this cream on Bloggers Required (it's similar to EtailPR and The Blogger Programme but you don't have to sign up, you can just apply to work with brands on the campaigns that are advertised) and I had to try it. I was very kindly sent the cream to review, for more information on my disclaimer, click here, honesty as always. I have the *My Trusty Little Sunflower Cream in the Lavender scent (100ml, £6.99). This cream is not just any cream, it was developed my the Salisbury District Hospital as a moisturiser for patients but it is now available to purchase online. And the best thing, all the profits from this cream go straight back to patient care! Now onto the product, firstly, I love the packaging - so simple but colourful, effective and eye catching. The cream comes in the lavender scent and also an unscented version. I picked the lavender version as the scent of lavender to me is just gorgeous and very appropriate for this time of the year. The cream itself is white and it looks pearlescent - metallic almost which is a bit unusual but you do not get glitter or shimmer on the skin thankfully. The cream is thick but smooth and it applies really well to the skin. I have mainly been using it as a hand cream and it works really well as a thick hand cream but the best thing about the cream...it absorbs so quickly, within 60 seconds it will be fully absorbed, unless you just loads and loads of cream at once! The cream sinks in well and doesn't really leave any residue, it moisturised my hands very well and leaves the skin with a slight floral lavender scent. As well as a hand cream it is great for the nails/cuticles and also elbows etc - it is a great multi-use cream. Overall, I am very impressed with this cream, it is really moisturising despite the fact that it absorbs really quickly. It has a nice scent, it doesn't irritate my skin (even my eczema - unless my eczema on my hand is very bad then I have to use a very basic face cream on my hand). I have tried a lot of hand creams such as the Soap and Glory hand food, a lot of the L'Occitane hand creams, one from Avene and more - my favourite hand cream ever is the Kiehls Hand Salve which is a miracle worker!! 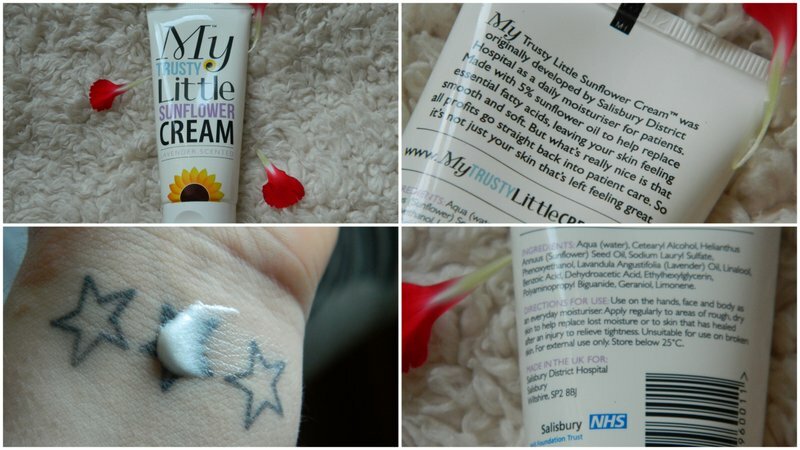 The My Trusty Little Sunflower Cream is a very good hand cream, it is just as good as the Soap & Glory and L'Occitane creams, in my opinion. ★★★★★, 5/5. Have you tried this cream before? What is your favourite hand cream? It's rare that you find a thick moisturiser that absorbs quickly, this must be fab! This sounds like it works really well for you!! This product works wonders! As a student nurse you end up washing your hands every 5 minutes, all other moisturisers stung and irritated my skin however this has restored them, all soft and smooth again now!